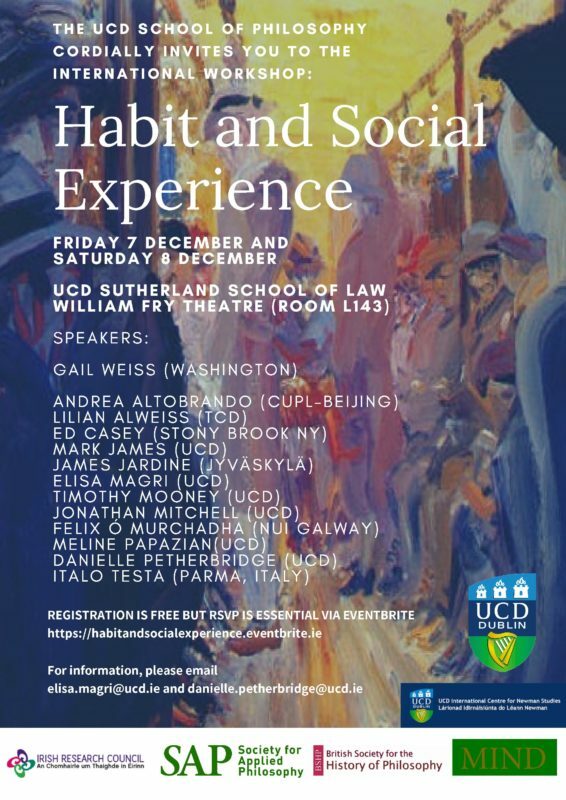 We are pleased to inform you that registration is now open for the international workshop Habit and Social Experience, which will take place in Dublin on Friday 7th December and Saturday 8th December at UCD Sutherland School of Law, William Fry Theatre (Room L143). For the registration, check please the platform of the international workshop Habit and Social Experience. With contributions by Andrea Altobrando, Lilian Alweiss, Ed Casey, Mark James, James Jardine, Elisa Magri, Timothy Mooney, Jonathan Mitchell, Felix Ó Murchadha, Meline Papazian, Danielle Petherbridge, Italo Testa, Gail Weiss. The workshop will start on Friday 7th December from 9.45am to 6pm, continuing on Saturday from 10am to 5pm. The programme will be made available in due course. The event is generously sponsored by Irish Research Council, The Mind Association, Society for Applied Philosophy, UCD International Centre for Newman Studies, UCD School of Philosophy, and the British Society for the History of Philosophy.